8 Aaron went to the altar and slaughtered the young bull for his purification offering. 9 Then Aaron’s sons presented the blood to him, and he dipped his finger into the blood and put it on the altar’s horns. He poured the rest of the blood out at the altar’s base. 10 He completely burned on the altar the fat, kidneys, and lobe of the liver from the purification offering, just as the Lord commanded Moses. 11 But he burned the flesh and hide with fire outside the camp. 12 Then Aaron slaughtered the entirely burned offering. Aaron’s sons handed him the blood, and he tossed it against all sides of the altar. 13 They handed him the entirely burned offering in pieces, including the head, and he completely burned them on the altar.14 Then he washed the insides and lower legs and completely burned them on the altar along with the rest of the entirely burned offering. 15 Next, Aaron presented the people’s offering. He took the male goat for the people’s purification offering, slaughtered it, and offered it as a purification offering like the first purification offering. 16 He presented the entirely burned offering and did with it according to the regulation. 17 Then he presented the grain offering, took a handful from it, and completely burned it on the altar, in addition to the morning’s entirely burned offering. 18 Aaron then slaughtered the ox and the ram—the people’s communal sacrifice of well-being. Aaron’s sons handed him the blood, which he tossed against all sides of the altar,19 and the fat pieces of the ox and ram—the fat tail, the covering fat, the kidneys, and the lobe of the liver. 20 They placed these fat pieces on the animals’ breasts, and Aaron completely burned them on the altar. 21 But Aaron lifted up the breasts and the right thigh as an uplifted offering before the Lord, just as Moses had commanded. 22 Aaron then raised his hands toward the people and blessed them. After performing the purification offering, the entirely burned offering, and the well-being sacrifice, he came down. 23 Moses and Aaron then entered the meeting tent. When they came out, they blessed the people, and the Lord’s glorious presence appeared to all the people. 24 Fire flew out from before the Lord and devoured the entirely burned offering and the fat pieces on the altar. All the people saw it. They shouted for joy and fell facedown. 1 Now Nadab and Abihu, two of Aaron’s sons, each took an incense pan. They put fire and incense on them and offered unauthorized fire before the Lord, which he had not commanded them. 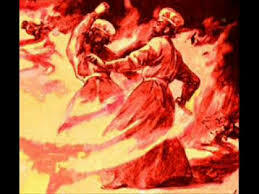 2 Then fire flew out from before the Lord and devoured them, and they died before the Lord. 3 Moses said to Aaron, “When the Lord said, ‘I will show that I am holy among those near me, and before all the people I will manifest my glorious presence,’ this is what he meant!” But Aaron was silent. 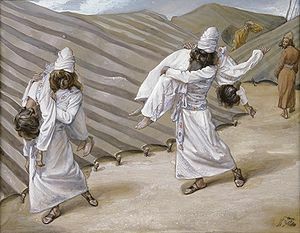 4 Then Moses called Mishael and Elzaphan the sons of Uzziel, Aaron’s uncle, and told them, “Go carry your relatives out from the front of the sanctuary to a place outside the camp.” 5 So they went forward and carried Nadab and Abihu out by their tunics to a place outside the camp, just as Moses had ordered. 6 Moses then said to Aaron and his sons, Eleazar and Ithamar, “Don’t dishevel your hair and don’t rip your clothes into pieces, or you will die and bring anger upon the whole community. Your family—all of Israel’s house—will mourn the burning the Lord has done. 7 But you must not leave the meeting tent, or you will die because the Lord’s anointing oil is on you.” So they did what Moses ordered. 8 The Lord said to Aaron: 9 Both you and your sons must not drink wine or beer when you enter the meeting tent so that you don’t die—this is a permanent rule throughout your future generations— 10 so that you can distinguish between the holy and the common, and between the unclean and the clean, 11 and so that you can teach the Israelites all the rules that the Lord spoke to them through Moses. 19 “Look,” Aaron said to Moses, “today they offered their purification offerings and their entirely burned offerings before the Lord, but these things still happened to me! Would the Lord have approved if I had eaten a purification offering today?” 20 When Moses heard that, he approved. 1 The Lord said to Moses and Aaron: 2 Say to the Israelites: These are the creatures that you are allowed to eat from the land animals: 3 You can eat any animal that has divided hoofs, completely split, and that rechews food. 4 But of animals that rechew food and have divided hoofs you must not eat the following: the camel—though it rechews food, it does not have divided hoofs, so it is unclean for you; 5 the rock badger—though it rechews food, it does not have divided hoofs, so it is unclean for you; 6 the hare—though it rechews food, it does not have divided hoofs, so it is unclean for you; 7 the pig—though it has completely divided hoofs, it does not rechew food, so it is unclean for you. 8 You must not eat the flesh of these animals or touch their dead bodies; they are unclean for you. 9 You are allowed to eat the following from all water animals: You may eat anything in the water that has fins and scales, whether in sea or stream. 10 But anything in the seas or streams that does not have fins and scales—whether it be any of the swarming creatures in the water or any of the other living creatures in the water—is detestable to you 11 and must remain so. You must not eat their flesh, and you must detest their dead bodies.12 Anything in the water that does not have fins or scales is detestable to you. 13 Of the birds, the following are the ones you must detest—they must not be eaten; they are detestable: the eagle, the black vulture, the bearded vulture, 14 the kite, any kind of falcon, 15 any kind of raven, 16 the eagle owl, the short-eared owl, the long-eared owl, any kind of hawk, 17 the tawny owl, the fisher owl, the screech owl, 18 the white owl, the scops owl, the osprey, 19 the stork, any kind of heron, the hoopoe, and the bat. 20 Any flying insect that walks on four feet is detestable to you, 21 but you can eat four-footed flying insects that have jointed legs above their feet with which they hop on the ground. 22 Of these you can eat the following: any kind of migrating locust, any kind of bald locust, any kind of cricket, and any kind of grasshopper. 23 But every other flying insect that has four feet is detestable to you. 24 You make yourself unclean by the following animals—whoever touches their dead bodies will be unclean until evening, 25 and anyone who carries any part of their dead bodies must wash their clothes and will be unclean until evening: 26 All animals that have divided hoofs, but they are not completely split, and that do not rechew food are unclean for you—whoever touches them will be unclean. 27 Of all the animals that walk on four feet, the ones that walk on their paws are unclean for you—anyone who touches their dead bodies will be unclean until evening. 28 Anyone who carries one of their dead bodies must wash their clothes and will be unclean until evening; these animals are unclean for you. 29 The following are unclean for you among the small creatures that move about on the ground: the rat, the mouse, any kind of large lizard, 30 the gecko, the spotted lizard, the lizard, the skink, and the chameleon. 31 Of all small moving creatures, these are unclean for you—anyone who touches them when they are dead will be unclean until evening.32 Moreover, anything on which one of these creatures falls when it is dead will be unclean, whether it is wood, cloth, skin, or funeral clothing—any such item that can be used to do work. It must be put into water and will be unclean until evening. Then it will be clean again. 33 If any of these creatures fall into a pottery jar, everything inside it will be unclean; you must smash the pot. 34 If water from such a jar gets on any edible food, it will be unclean; any drinkable beverage in such a jar will be unclean. 35 Anything on which a part of these animals’ dead bodies might fall will be unclean. If it is an oven or stove, it must be destroyed; they are unclean for you and must remain that way. 36 Now, a spring or cistern that collects water is clean, but anyone who touches one of these animals’ dead bodies in it will be unclean. 37 If any part of these animals’ dead bodies falls on seed that is to be planted, the seed is still clean. 38 But if water is poured on some seed and part of their dead bodies falls on it, it is unclean for you. 39 If one of the animals that you are allowed to eat dies naturally, anyone who touches its dead body will be unclean until evening. 40 Anyone who eats from the dead body must wash their clothes and will be unclean until evening. Anyone who carries such a dead body must wash their clothes and will be unclean until evening. 41 Every creature that swarms on the earth is detestable; it must not be eaten. 42 Among all such creatures that swarm on the earth, you must not eat anything that moves on its belly or anything that walks on four or more feet because they are detestable. 43 Do not make yourselves detestable by means of any swarming creatures. Do not make yourselves unclean with them or be made unclean by them. 44 I am the Lord your God. You must keep yourselves holy and be holy, because I am holy. You must not make yourselves unclean by any swarming creature that crawls on the ground. 45 I am the Lord, who brought you up from the land of Egypt to be your God. You must be holy, because I am holy. 46 This concludes the Instruction concerning animals, birds, all creatures that live in water, and all the creatures that swarm on the earth, 47 in order to distinguish between the unclean and the clean and between creatures that can be eaten and those that cannot.